QUESTIONS? 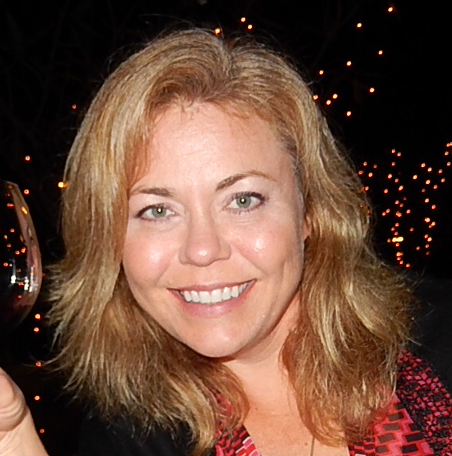 REGISTER FOR A PREVIEW AND LIVE Q&A ON TUESDAY, OCTOBER 20TH @ NOON PACIFIC TIME! How amazing would it be to open your refrigerator on Monday morning and see a week’s worth of healthy, nourishing meals? You’d feel like you were coming home at night to relax…not like you were starting work all over again. You’d know that a home-cooked meal could be on the table faster than pizza delivery. You’d be able to look forward to indulgent, veg-centered dishes every night of the week – not just on the weekends. These are fast becoming my favorite go to recipes for quick veggies for dinner. Everyone I know has found them delicious! Even those who aren’t veggie fans (like, not even iceberg lettuce) have liked them. I've found that the recipes are great, but can also be tweaked with my favorite seasonings to compliment my main course as I go through the week, at least if I have leftovers :-). It’s great to have stumbled onto Cook the Seasons just in time! You start every week with good intentions (and a crisper drawer full of kale), but in reality you just can’t fit healthy, seasonal cooking in on busy weeknights. Because when it comes time to turn your refrigerator full of raw ingredients into full-fledged meals, you get home later than planned and you’re starving, and you just don’t have the energy to tackle all those veggies. So you heat up a pizza, or call for takeout ... and when Saturday rolls around again, you can’t help but feel guilty as you toss the wilted kale and slimy cukes into the trash (you’re not alone … the average American throws out a third of the food they buy, which adds up to literally hundreds of dollars a month) before heading out to the farmers’ market to start the cycle all over again! I'm Lia Huber, founder of the NOURISH Evolution and creator of Cook the Seasons, and I'm about to become the best thing in your kitchen since sliced whole grain bread. You can trust you'll love my recipes because you already do. I've been writing for magazines that are probably on your coffee table now--like Cooking Light, Eating Well and Health--for over 15 years. So it's like we already know each other. But here's why you really want me in your kitchen. 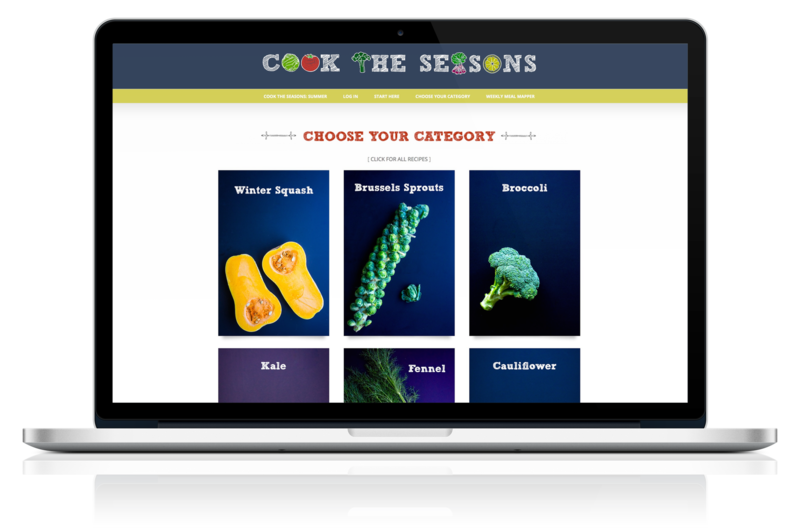 My new program, Cook the Seasons, is a revolutionary approach to meal planning for busy people who want a healthier, simpler and downright tastier way to eat. We had green beans and marinated tomatoes (red and yellow!) on our plate tonight with chicken paillards and corn with lime butter. My youngest said, "why can't we always eat like this and not fast food?" Out of the mouths of (teenage) babes! The family is fighting over leftovers!! LOL!! The kids (5, 7 and grown up kiddo) are arguing over who gets to eat the leftover fish and lamb chops. Love that this food is so delicious. So simple, but incredibly flavorful!! Choose scrumptious “core” recipes made from peak-of-the-season summer veggies and fruits. Then round them out with other core whole grain, fish, poultry and meat recipes--like mix and match. Next, re-purpose those core recipes for easy, done-for-you meals throughout the week. I call these re-purposed dishes “reinvention” recipes because while they may use what you’ve already got in the fridge, they’re a far cry from uninspiring leftovers. I’ve put, literally, hundreds of hours into thinking all of this through so that you don’t have to. Unlike other menu planning services, Cook the Seasons doesn’t present you with an all-or-nothing proposition (What if you don’t like shrimp? What if you’re going out on Thursday night? What if your spouse is lactose-intolerant?). Nor does it pile unrelated recipe upon unrelated recipe, which just leads to exhaustion, burnout, and a fridge full of spoiled leftovers. Cook the Seasons is flexible. You choose. 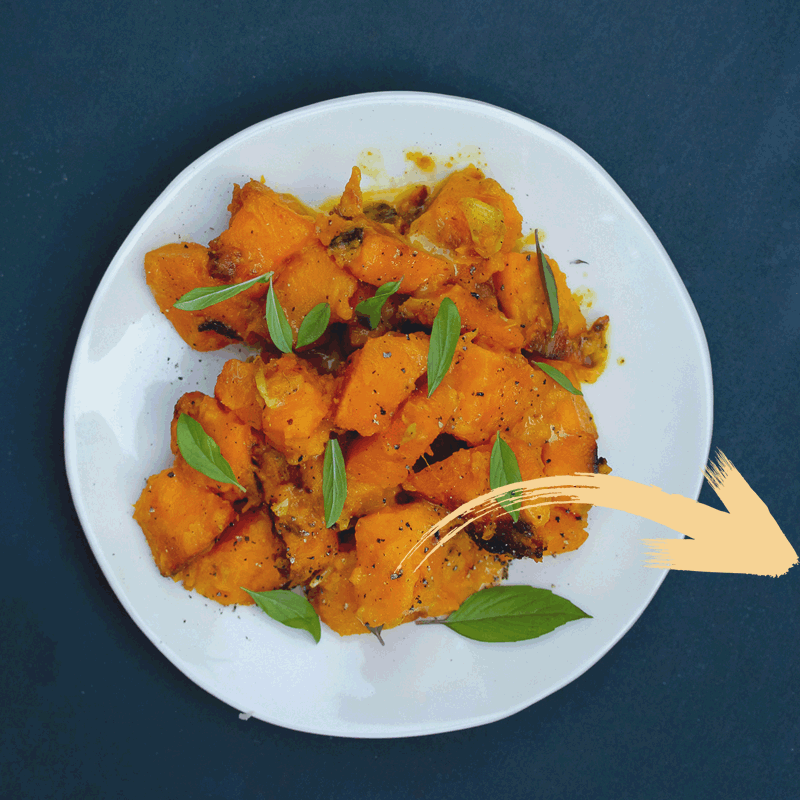 Build the week around your schedule, and build your meals around your tastes – each recipe has icons to indicate whether it’s gluten free, vegan, paleo-friendly or dairy free. I’ve even marked the ones that’ll freeze well or make great leftovers for lunch. How amazing would it be to eat everything you make and use everything you buy? How awesome would it be to sit down to a Pinterest-like screen full of drool-worthy food photos ... but rather than being overwhelmed by what to choose, or worrying whether it was healthy, to know that everything on the screen was nourishing? And that everything on each screen went together, like a mix-and-match outfit? A gorgeous, Pinterest-like interface where you’ll get all 70+ recipes for the season (you can browse on your computer, tablet or phone, and print out any you like). Dynamic sidebars for each recipe show you what other core recipes it goes well with, and what reinvention recipes are made with it. Get stocked up for success. Think of your pantry as the backbone of seasonal meals. I’ll tell you just what you need and how to use it (for example, do you know which olive oil to use when?). Make sure you have everything you need to make your prep as painless as possible. These are essential tools you’ll use each week…you might be surprised by how simple most of them are! Look out for my e-mail in your inbox each Friday. I’ll have a fun bonus recipe for you, plus my own Weekly Meal Mapper in case you want to swipe my plan for the week. 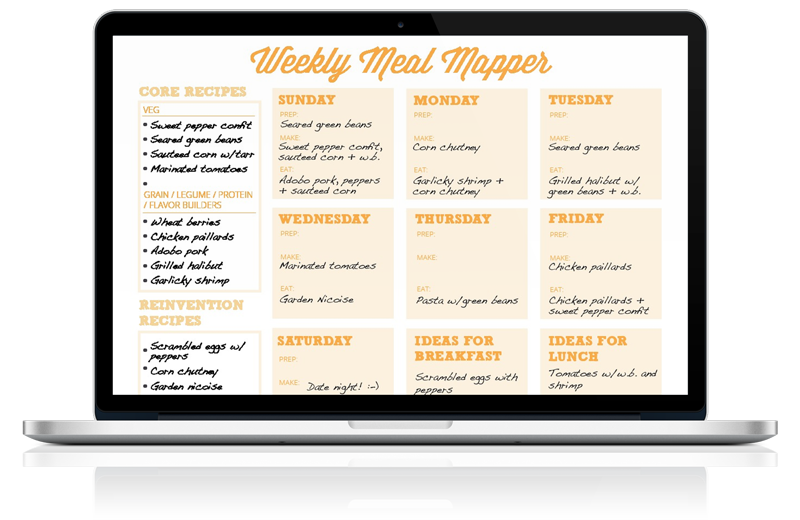 Or create your own by printing out a fresh Weekly Meal Mapper sheet. Assign meals to each night of the week. Then set aside 60-90 minutes over the weekend to prep and cook some of your core recipes before the week begins, knowing that this is the most hands-on time you’ll spend in the kitchen all week. Gaze lovingly at the fruits (or rather vegetables!) 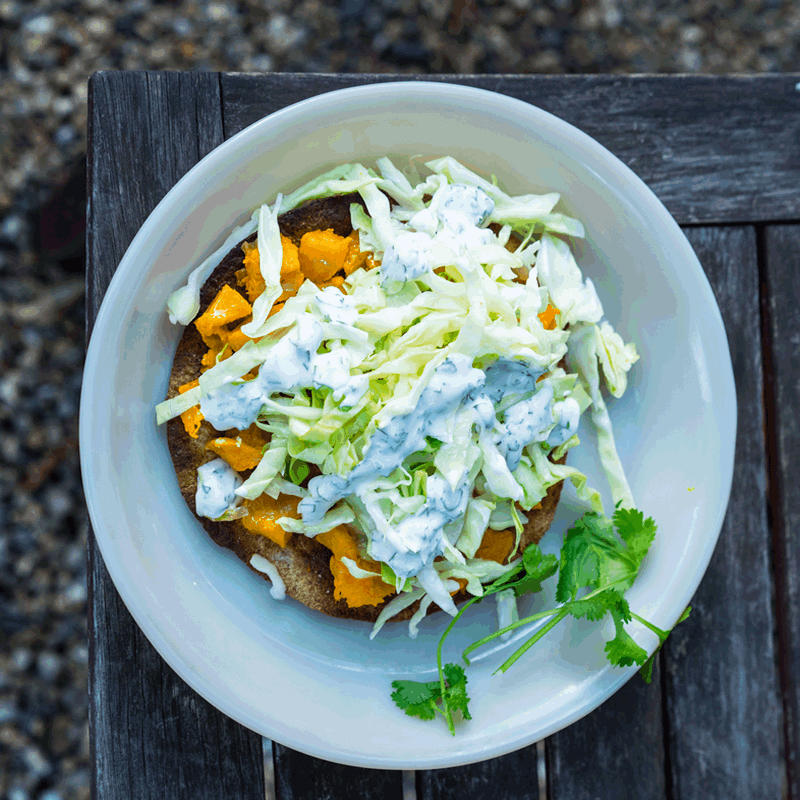 of your labor knowing there’s a week’s worth of nourishing, seasonal meals in your fridge. 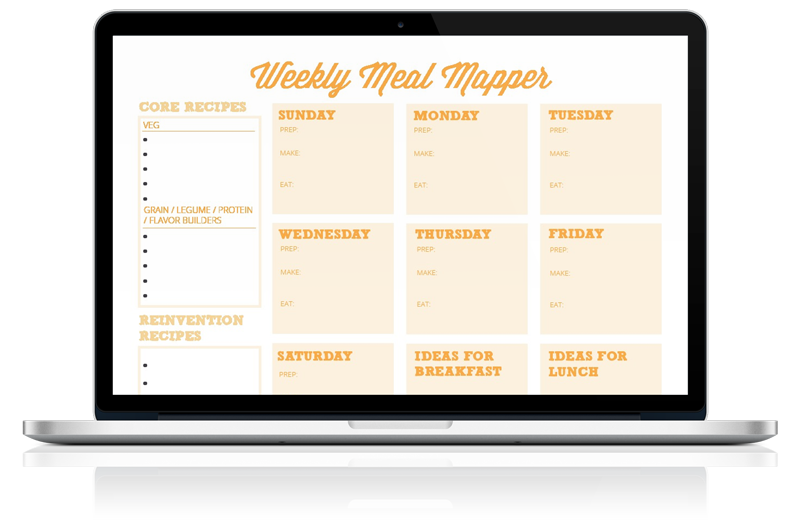 Then let your Meal Mapper do the heavy lifting and enjoy the extra time you have during the week! Seasonal eating has never been this simple. Having a great time with Cook the Seasons. Made the Baked Ratatouille Penne last night after pre-making Ratatouille, Melted Squash, Sautéed Corn and Shallot Dressing. I have plans for all of it. You’re stuck in a bit of a food rut – Tuesday, tacos. Wednesday, pasta. Always. Are you ready to indulge in scrumptious seasonal meals, save time and money, and feel better about what you’re eating than you ever have before? My mission in life (really!) is to inspire and equip people to make a lasting shift from processed food to real food in real life, which is what drove me to create Cook the Seasons, and why I’ve packed it with as much value as possible. I believe in walking the talk. Best of all at just $59 for 3 months’ membership or $149 for the entire year (3 seasons with 12 months access) the investment is something that just about everyone can say “yes” to. Having a hard time believing Cook the Seasons is worth the $59 investment? Just take a moment and think about the food you’ve thrown away this week. According to the United States Department of Agriculture, an average family of 4 in the U.S. throws out 30% of the groceries they buy every single week and spends an average of $223 per week. So by using Cook the Seasons you could easily recoup your investment in one (absolutely delicious) week. All the Facebook posts are so encouraging with great tips. The camaraderie is worth the price of admission itself. First day using the program and it's already saving me from having to throw stuff out. AND the recipes were delicious. It's a winner!! Tonight is garbage night and I don't have anything to throw out! Everything I bought this past weekend I have cooked and eaten! 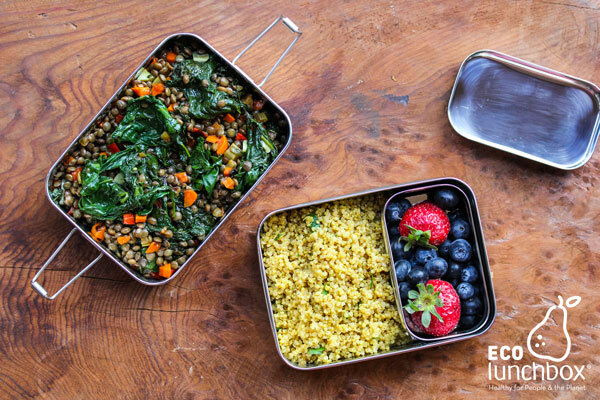 Our awesome friends at ECOlunchbox--a company dedicated to making plastic and BPA-free totable containers that are perfect for Cook the Seasons leftovers--are giving 20% off to Earlybirds. 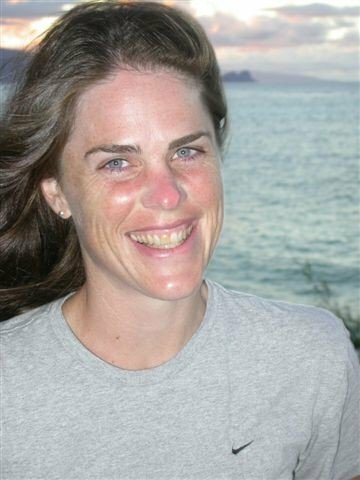 Sandra Harris started ECOlunchbox in 2009 when her quest for non-toxic containers for her kids' lunches turned up doughnuts. Choose from their bento-esque stackable boxes, round stainless steel, or new Blue Water Bento collection, which matches stainless steel containers with colorful, no-leak silicone lids. Exclusive access to a live webinar where I’ll be available to answer your questions, offer tips and help you start FALL off right. 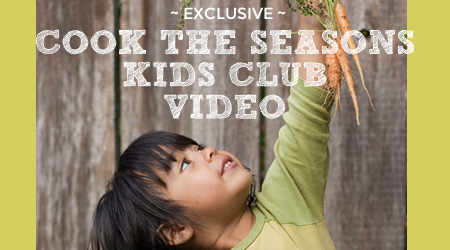 Exclusive access to my Cook the Seasons Kids Club video to give you all you need to get your kids excited about digging in. I’ve taught thousands of parents how to get their kids psyched about nourishing meals through my classes and on TV. In this video, I share my best tips … plus, my 9-year old daughter, Noemi, makes a cameo appearance to give your kids a tutorial on how to use the program. Honestly, I deliberately stacked the odds with Cook the Seasons by using colorful, pretty pics and making it interactive on iPads and computers – what kid wouldn’t want to “play”? Saving time and money has never tasted so good. Lia, it's true what they say, the teacher will appear when the student is ready. Thanks for helping me see what I can do for (and with) my family! 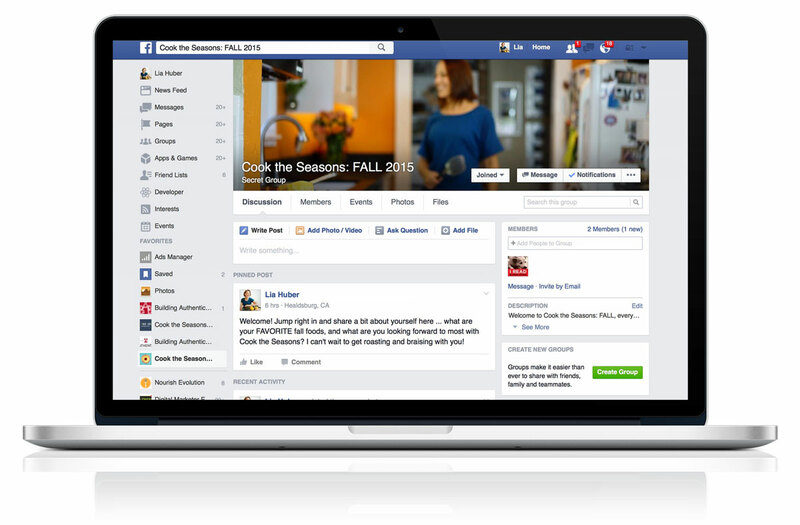 I created Cook the Seasons specifically to help you move forward on your NOURISH Evolution. So what, I can hear you asking, is a NOURISH Evolution? 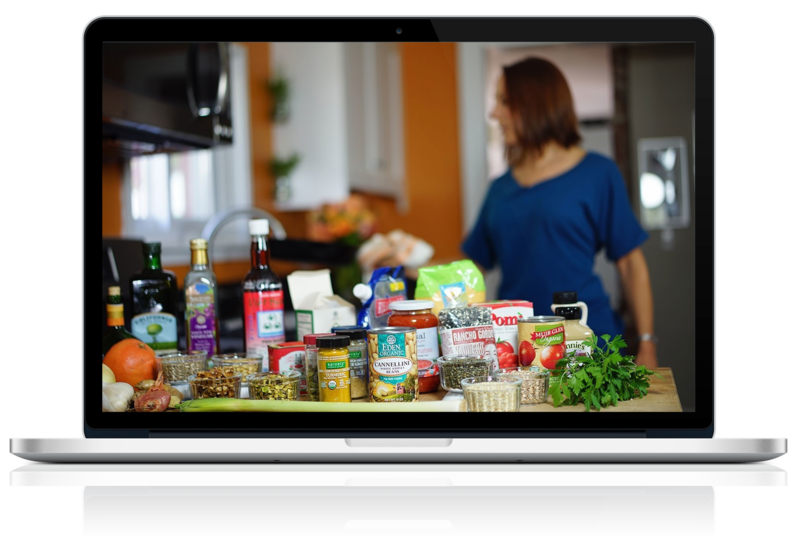 It’s a five-stage journey we all take as we make the shift from processed foods to real foods. Blissfully Blind Prairie is where everyone begins, eating whatever is in the path of least resistance and having no desire to change. This is the stage where you glimpse the consequences of staying in Blissfully Blind Prairie. There is desire to change, but not much will, and not much know-how. The Hump is the "something" that moves you out of the Pinnacles of Should-Angst and towards real change. Often, though not always, it's a "life event." 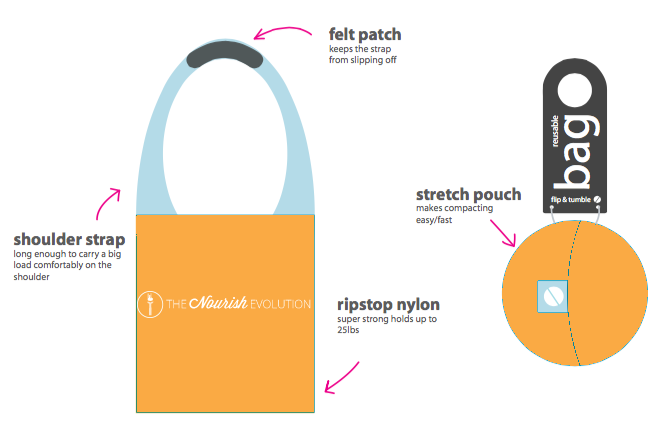 This is the process of developing new habits through trial and error when making the shift from processed to real food. You know you’re there when your default is cooking—and thoroughly enjoying—real food…within the demands and challenges of real life. While I might live in the Land of Nourish now, that hasn’t always been the case. I spent many a year in my teens and early twenties stumbling around in the Blissfully Blind Prairie eating pretty much anything I fancied. 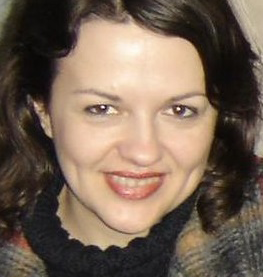 Later, as a food writer and recipe developer I probably knew more than most about what I shouldn’t have been eating, which made my time in The Pinnacles of Shouldangst all the more difficult to swallow. But it wasn’t until I reached The Hump that I knew I needed to make a massive change. Everyone’s Hump is different but mine came in my mid-twenties when, out of nowhere, I started experiencing unbearable aches and pains that kept me up all night and severely impacted my mobility. After several trips to the doctor’s office and numerous blood tests I was diagnosed with Lupus and told in no uncertain terms that I would need to significantly change the way I ate. There I was, a professional food writer and recipe developer for a major “healthy” food magazine being told I needed to eat more healthfully. The good news is, that diagnosis turned the way I ate upside down forever. I got to work researching the healthiest possible way to eat which I knew as a life-long vegetable shirker, was almost certainly going to be hard to stomach. I should eat more vegetables, a handful or two of whole grains and round out my meals with attentively-sourced fish, meat and poultry. After making my discovery, I dove in headfirst and set up camp in The Peaks and Valleys of Practice. Pretty soon I was cooking and eating vegetables I’d never even heard of, and was surprised to realize vegetables I’d always disliked intensely tasted so freaking amazing when they were eaten in season (spongy tasteless tomato in January anyone? Thought not.) and given a little TLC. Several years on and I now live in The Land of NOURISH, where cooking from scratch and eating with the seasons has truly become my default. And as a result, I'm calmer yet have more energy, I weigh 15 pounds less and never feel like I'm on a diet ... I'm healthy and get more pleasure from eating than I ever did before. I know this is a place a lot of people aspire to get to but struggle to reach, which is exactly why I created Cook the Seasons. Whether you're in the Pinnacles of Should-Angst looking to make a shift away from processed food, or in the Peaks and Valleys of Practice craving new flavors, Cook the Seasons will make a radical difference. I hope to see you in there! If you’re currently listening to an internal monologue that’s looping over and over and sounding a little like this: “This could work. But will it work? It’s got to work…hasn’t it?” it's time to take a step back.The investment you’re about to make in Cook the Seasons is an investment in your sanity. I’ve invested a huge amount of time and energy into the program to take the hard work and effort of trying to figure out what to feed your family off of YOUR plate. 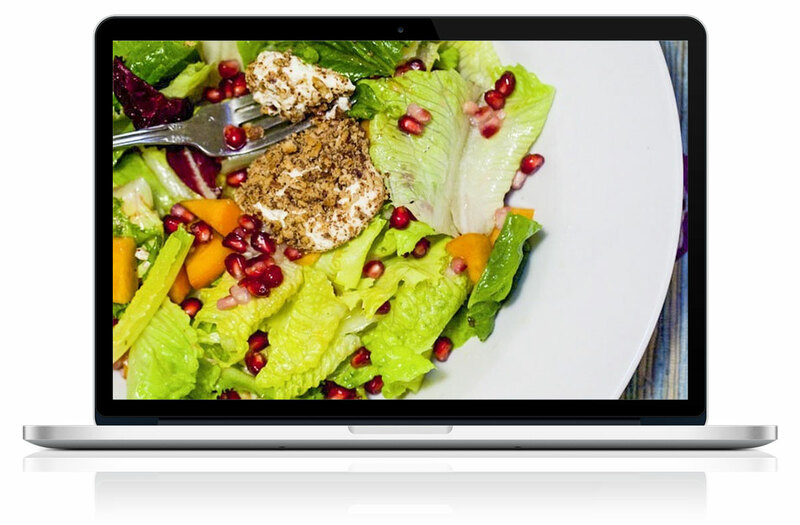 I can’t categorically promise that Cook the Seasons will work for you or that I can transform the way you eat in 12 weeks – only you have control over that. What I can tell you is if you follow the Cook the Seasons approach to cooking dinner, you will save both time and money. Unlike other approaches to meal planning, when you use a Cook the Seasons core recipe you’re not just preparing food for a single dish; you’re creating an incredibly versatile edible building block that can be reinvented into other super-easy, absolutely delicious meals later on in the week. This approach to cooking and eating personally saves me oodles of time and money every week and gives me the reassurance that I can always pull a nourishing, satisfying and tasty meal together in a pinch, without my family feeling like I’ve compromised on taste. We have a pretty hectic family schedule and we don’t sit down to eat as a family every night. Will Cook the Seasons still work for my family? Yes. The beauty of Cook the Seasons is that you get to craft out each week to work for your schedule. 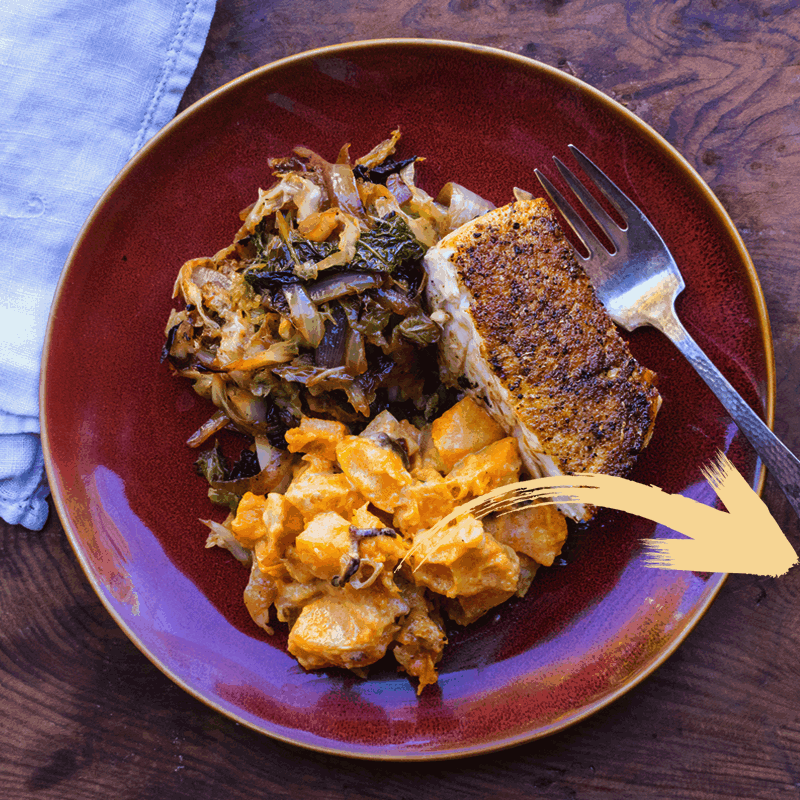 Plus, all the prep is done at the beginning of the week and with the core recipe components prepped ahead of time, so whether you’re cooking for one person or six people, you’ll be able to pull a meal easily in minutes. And you can choose just how many meals you plan for the week, whether one or seven or anything in between. I have some fussy eaters around my dining table and other meal planning services haven’t worked well for me. How is Cook the Seasons any different? Oh my gosh! I know exactly what you mean! I’ve tried out a bunch of meal-planning options and I know how frustrating it can be when your kids refuse to eat the dish because they don’t like it, or you have to spend time you don’t have substituting ingredients to work around food sensitivities and allergies, or what you already have in the fridge. 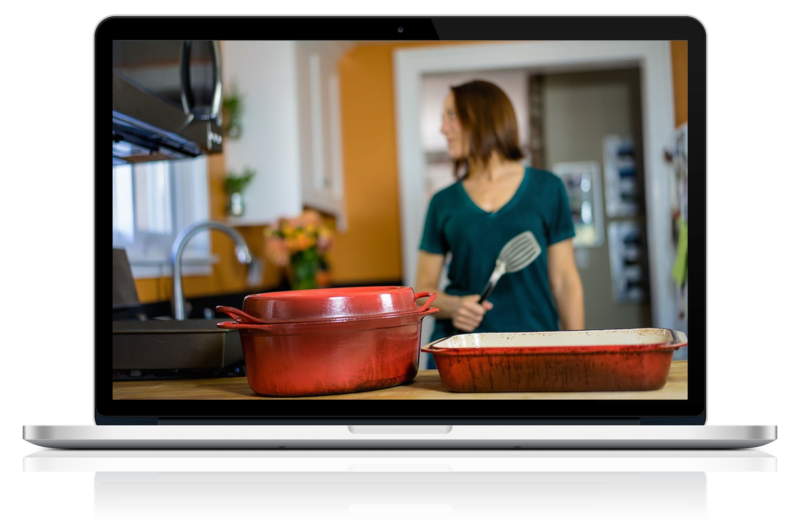 With Cook the Seasons you create your own Meal Mapper each week so you’ll be free to select only those dishes that you know you and your family will love. 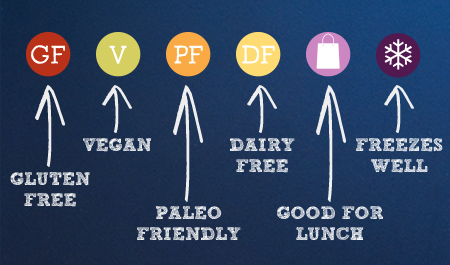 I’ve even got icons to indicate whether a recipe is gluten free, vegan, paleo-friendly or dairy free, so you can easily customize your meals to what you need. 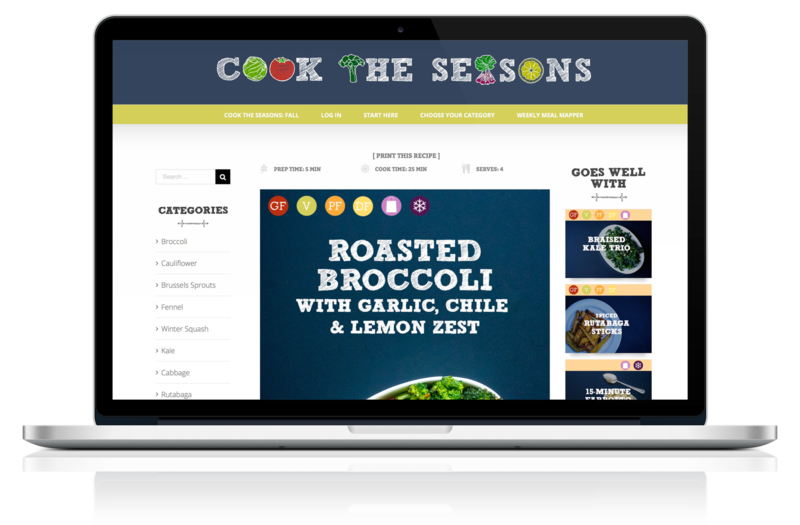 What’s more, Cook the Seasons is hosted on a gorgeous, very visual, mobile-friendly website, making it incredibly easy to involve the whole family in planning your meals for the week ahead. The more you get kids and picky eaters involved in the meal planning process, the more likely they are to eat and enjoy the meals you make. I’ve got loads more advice in the fast-action bonus Kids’ Club video, so check it out! How come there are only three seasons if I buy 12 months’ access? There aren’t too many changes to the supply of vegetables during the autumn and winter seasons, which is why I’ve decided to combine these seasons together and provide more recipes to give you plenty of variation. Do I have to participate in the Facebook community? Not at all. But I’ll bet once the program is up and running you’ll want to compare notes on what you’ve been eating! When will the live bonus webinar be held? 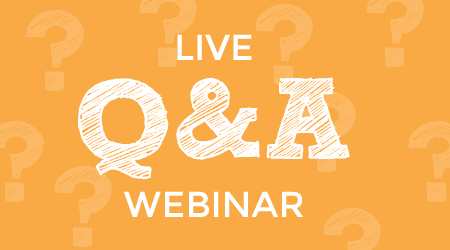 I’ll be hosting the Kickoff Q&A Webinar on Wednesday, October 21st when the program kicks off. But don’t worry if you can’t make it live – a replay will be sent to everyone in the Cook the Seasons community that snags the bonuses and you’ll have an opportunity to submit as many questions as you like via email or on Facebook. You can purchase Cook the Seasons: FALL via PayPal or with any major credit card. Just take a moment and think about the food you’ve thrown away this week. According to the United States Department of Agriculture, an average family of 4 in the U.S. throws out 30% of the groceries they buy every single week and spends an average of $223 per week. So by using Cook the Seasons you could easily recoup your investment in a single (absolutely delicious) week. When you look at it that way, doesn’t $59 feel like a complete steal? I really believe in this program and I know that if you use your Meal Mapper, shop with a list and invest 60-90 minutes to meal prep at the start of the week, your evening meals will be changed forever. That said; if you decide Cook the Seasons just isn’t for you within 14 days, I’ll gladly issue a refund. Halibut, sautéed green beans, marinated tomatoes, and peach salsa. Oh my. My husband has ogled over every single meal that I have made since starting. Delicious and healthy. Cook the Seasons: FALL closes on October 20th (program starts October 21st) and the Early Bird Bonuses fly away Saturday, October 17th.